This week has been a doozy, and I'm glad it's over. I'm not sure if it's the new year, or if it's this time of year, but I'm currently in a no-fuss kinda mode. I've been more into things being clean, simple, and easy. It's translated into my beauty routine as well. Hair is even having a minimalist moment. Take today's hairstyle, for instance. Seen all over the runways, the smooth and sleek low ponytail with a dramatic center part is so big right now. It adds instant sophistication and luckily for us, it can be easily recreated. 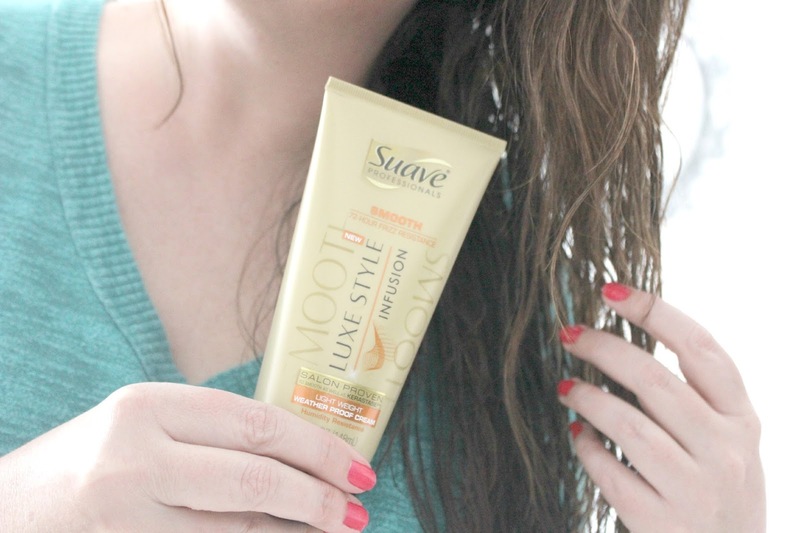 I was sent some of the amazing new Suave Professionals Luxe Style Infusion Smoothing collection and was really impressed with how well it worked. This is so easy, y'all. First, a little background on my hair. It's naturally wavy, coarse, and is frizzy. 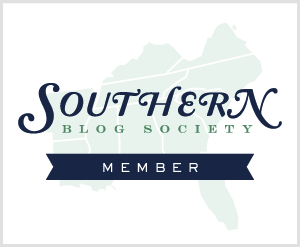 The latter trait is even further enhanced thanks to the humidity of living in the South. Wavy, frizzy city, y'all. And I managed to sleek it down using just one product. 1-I think this is the first time I've shared my wet hair on the blog. Ha! Anyway, the first thing I did was apply Suave Professionals Luxe Style Infusion Smoothing Light Weight Weather Proof Cream through my combed out damp hair. 2-Using this brush and a hair dryer, I straightened my hair. I skipped using the nozzle on the dryer here, since I'm using this type of brush, but use if you'd like. If you already have straight hair, go ahead and part hair down the center then smooth over frizz and flyaways with a dime sized amount of the Suave Professionals Luxe Style Infusion Smoothing Light Weight Weather Proof Cream. 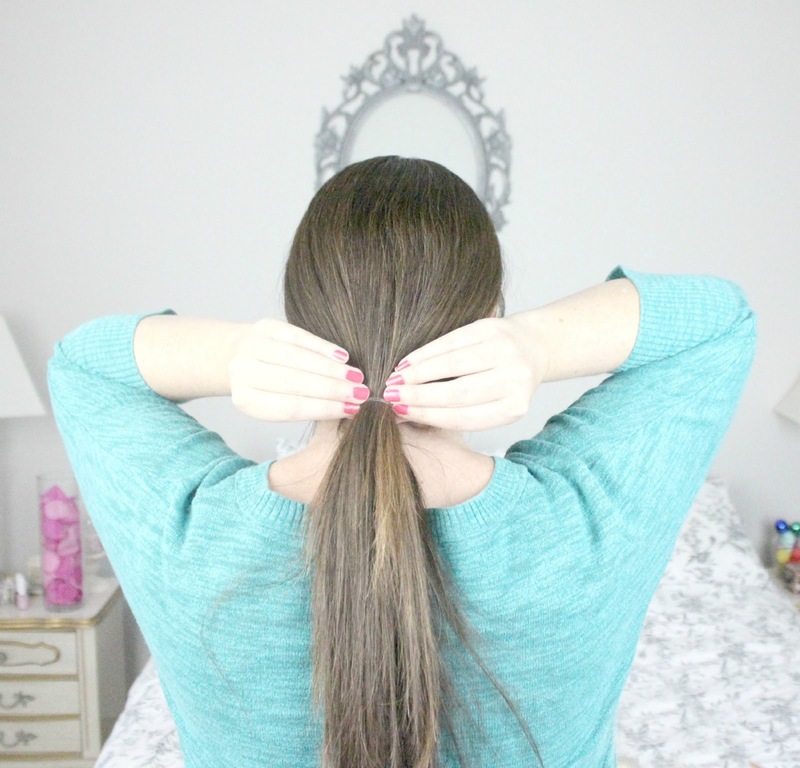 3-Gather hair into a low ponytail and secure with a clear elastic (pictured above). Wrap a small section of hair from the ponytail around the elastic and secure with bobby pins. 4-Optional: Run a flat iron over the ponytail for an extra smooth finish. That's it! Thanks to the Suave Professionals Luxe Style Infusion Smoothing Light Weight Weather Proof Cream, this hairstyle has survived the crazy weather this week of rain, snow, sleet, and more rain. All WEEK! It's that good. Now, go get ya some! 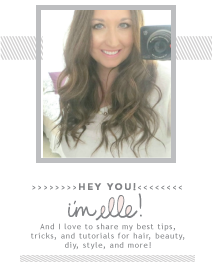 LAST CHANCE to enter my $50 ULTA gift card giveaway. This is from me to you, to thank you for subscribing to my Youtube channel. Love y'all and your continued support! Love this slick pony, you have fabulous hair. Great hair tutorial! I think my hair has been in a top knot all week, so this would be a good go-to instead. Have a great weekend. I love no-fuss hair styles! The easier the better too since I'm not so great with doing my own hair. Hope everything is ok with your family. Thinking about you! I enjoy learning about caring for girl-hair even though I don't have any. It's like people who like reading about yachts when they don't have one. I like the extra stuff. I love your beauty tips, too, but I like to comment on the personal stuff too. But, we will still read, of course, if you decide to take these items out. I rarely wear my hair straight in the summer because of the humidity. I will have to give this a try! This is great because I rock a low pony tail all the time. The worst is when it's alllll frizzy! I LOVE this look on you, Elle! Low ponytails have been my jam for like the last month - I love how they look! Definitely need to check out the Suave Professionals Luxe Style Infusion Smoothing Light Weight Weather Proof Cream! I love this look! Very sophisticated. You have such pretty hair. I would defintely like to try the products. When it says tame the frizzies I am in! I always am having fly-aways so I love any tip on pony tails looking classy. Great tutorial. Going to have to try this out. It looks so sleek and silky! You're making me wish I had long hair now. 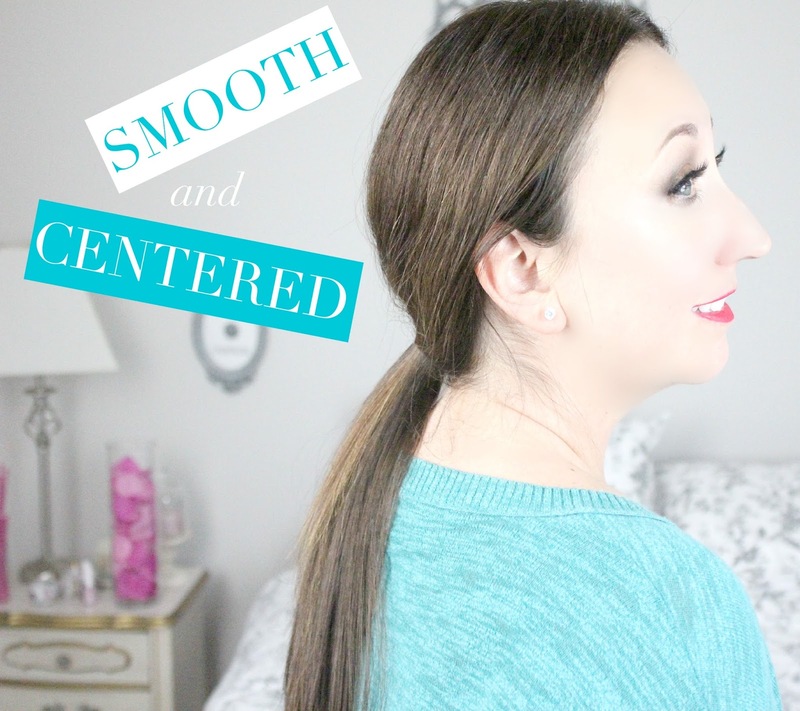 A sleek, low-pony is one of my go-to hairstyles! It's so simple and pretty. Have a great weekend! I would usually go fr a higher pony tail bt wud love to try this as well as it is in trend!! I'm going to have to try this product! It's sounds like it gives the same results as Living Proof and you can't beat the price. 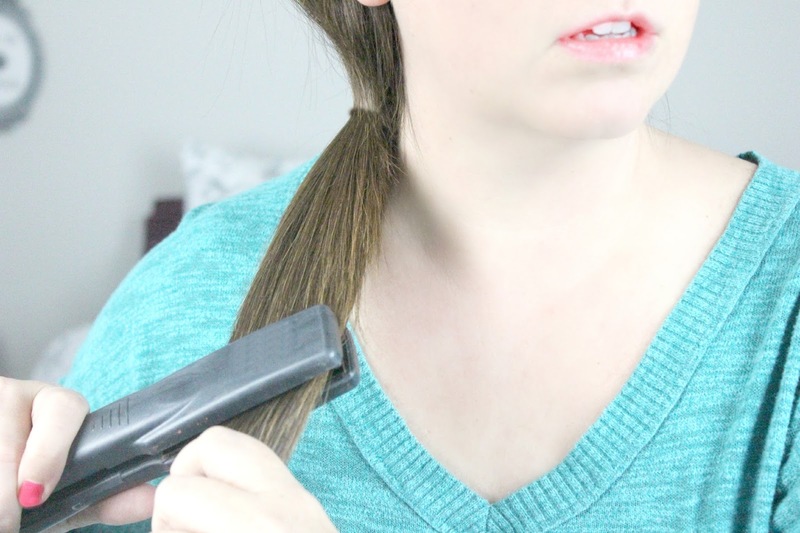 Your hair looks great in a sleek ponytail! You look lovely and I like low ponytails as well, just that for me, they don't suit very much - I tend to wear higher or at one side :) But a low ponytail is always so elegant! I love this sleek, simple, yet still really pretty, look. I'm definitely not there yet with my hair's length, but I'll get there! In the Winter I am all about low maintenance because the cold weather is draining. Love the look of the low pony. I never think to straighten m y ponytail but I rarely wear one unless i am pulling up hair up in the middle of the day. Love the smooth ponytail. I usually go for a a high ponytail or topknot when my hair is straightened. Think I'll try this next time. What kind of brush did you use? It looks cool. Just wanted you to know I'm thinking of you. I have been in minimalist mode lately too! I wore a pony tail to work two days this week. Hope you have a great weekend! 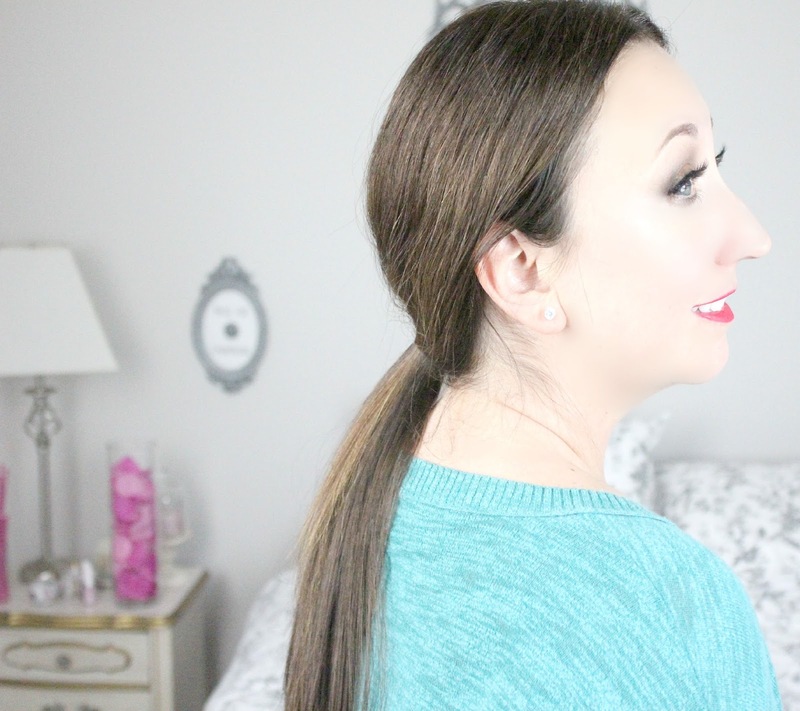 I just love a pony tail look and I am so loving this tutorial. You are seriously making me miss my long hair! I love the ponytail! Wear my hair like that all the time. Your hair looks great! Thanks for sharing! Love this! I always love a good sleek pony! I love Suave products! 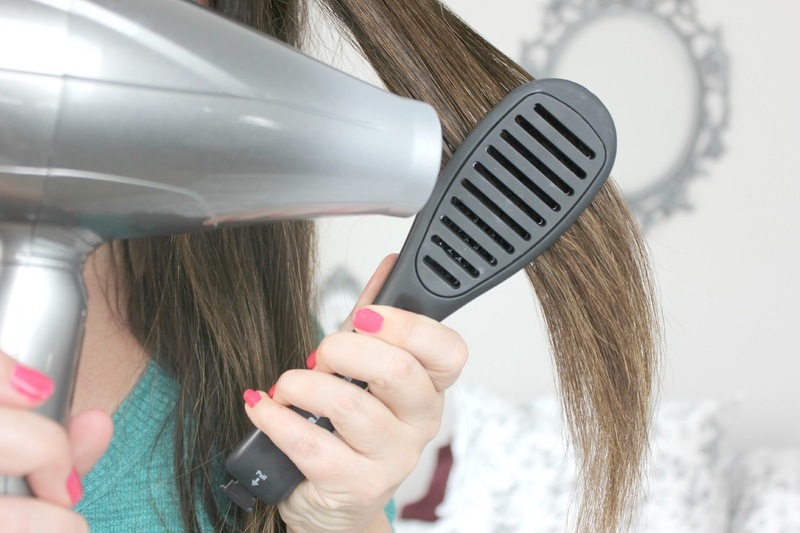 I have the Sleek no-frizz products and I love it, so I'll have to check this one out! Ponytails were popular at the Oscars too! Love this easy yet sophisticated style! Your hair looks great. No fuss is the best! So pretty, this would be perfect for work! ooooo, we love how this turned out with your ponytail, so chic!! I am so lazy when it comes to my hair, I often don't blow dry it. And also because the ends of my hair tend to be really dry, so I'm always afraid of damaging it more with the blow dryer. I, personally, am not a fan of a low pony tale -- I think it bothers be having all my hair so close to my neck. If I'm going to put my hair away from my face, 9 times out of 10 I'm pulling it up for a high pony tale. That's just how I roll, lol! But I still enjoyed reading this tutorial. You're always so good at capturing the right picture for tutorials. :-) Love ya!